You may sometimes need an easy access to your Tomcat logs outside of the hosting server. 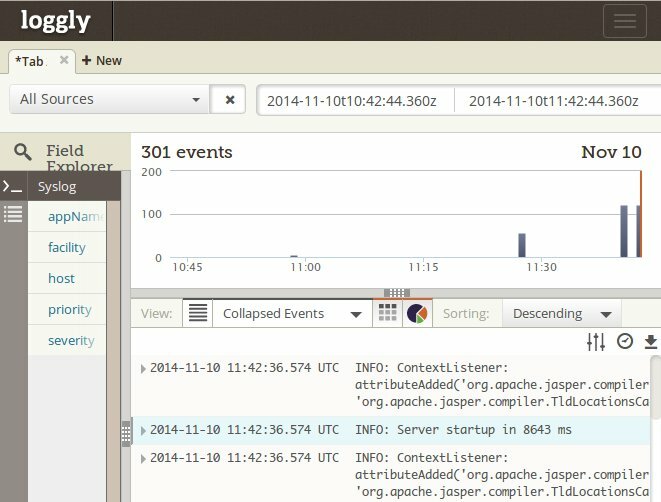 Loggly is one of the solutions but setting it up on a shared server is not straightforward. Loggly installation guide assumes you have superuser privileges (VPS/dedicated server) so that Tomcat is installed system-wide and rsyslog.conf can be easily modified. If it is not the case and you are for example using private JVM on shared host read this tutorial to have your Tomcat working with Loggly in a few rather simple (we hope ;) steps. Basically you will need your private rsyslogd service running on one of your custom ports. Check cPanel - Java Control Panel - Ports for an unused port number or request support to assign you one. The testing environment for the below example was Centos 6 64-bit. User home directory was /home/tomcat - change it in all occurences below to your value. Register for Loggly account - it may be trial. Make sure compiler is available on your account. If not the ask support to enable it. Make sure outgoing TCP port 514 is open in firewall for the user. Consult with support. Default rsyslog version in Centos 6 is 5.8.10 so let's use neweset 5.8.x for highest compatibility. Imfile module will be needed to trace Tomcat log file. It uses inotify by default. As imfile is off by default we need to enable it in configure line. Create ~/etc/rsyslog.conf - replace TOKEN with your Loggly token and $WorkDirectory with your own path. $template LogglyFormat,"<%pri%>%protocol-version% %timestamp:::date-rfc3339% %HOSTNAME% %app-name% %procid% %msgid% [TOKEN@41058 tag=\"MyRsyslogd\"] %msg%\n"
There should be no error diplsayed and the process will go to the background. Check for first messages in loggly. This way you will have catalina.log, catalina.out, host-manager.log, localhost.log and manager.log in your logs directory. Note the names no more contain variable (date) part (after Tomcat restart). Enable montoring of the files in rsyslog.conf by appending the follwing lines to ~/etc/rsyslog.conf. You are done! See the screenshot below. Messages from Tomcat log should now start coming to Loggly. Another option is logging from Log4j to rsyslogd with UDP and we describe it below. As for keeping rsyslog up it can either be started/stopped along with Tomcat or we can setup monit task that it will take care of it to be always up. Then copy in Log4j jar (e.g. log4j-1.2.17.jar) into $CATALINA_HOME/lib unless you already have it there or inside WEB-INF/lb of a specific application you want to log for. As we are making the change for whole Tomcat we will also need tomcat-juli-adapters.jar and tomcat-juli.jar from Tomcat extras. Ensure you download them from correct extras'matching your Tomcat version. Create or modify log4j.properties - we will use fresh Tomcat-wide version of the file placed in lib directory. The above example only ensures logging to Loggly. Read more here about fully replacing Tomcat logging mechanism with Log4j at http://tomcat.apache.org/tomcat-7.0-doc/logging.html#Using_Log4j if you also want to have logs preserved in Tomcat's log directory and displayed on console (standard output). Restart Tomcat and you should see new logs in Loggly. Instead of using '-i' switch to indicated pidfile path you could update sources to have pid file in your home directory with this patch.